A spinal tumour is a growth that develops within the spinal canal or within the bones of the spine and may or may not be cancerous. 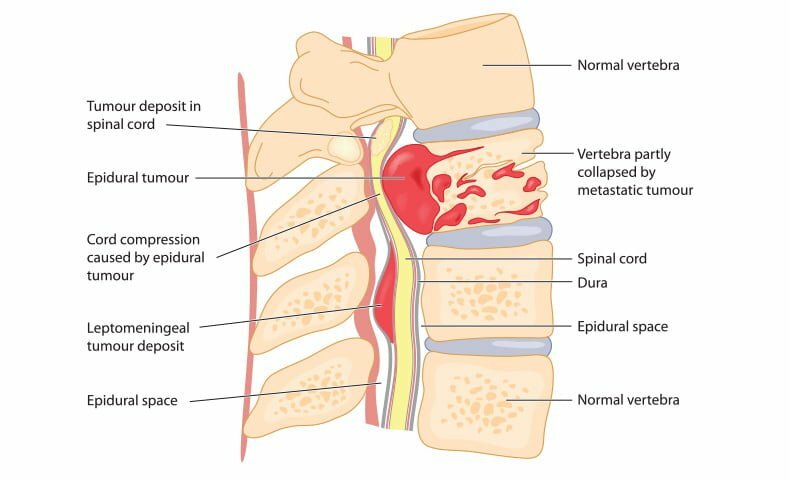 Tumours that affect the bones of the spine (vertebrae) are known as vertebral tumours while those that begin within the spinal cord itself are called spinal cord tumuors. The two main types of tumours that may affect the spinal cord are Intramedullary tumours which begin in the cells within the spinal cord itself; and Extramedullary tumours which develop within the supporting network of cells around the spinal cord. Although they don’t begin within the spinal cord itself, these types of tumours may affect spinal cord function by causing spinal cord compression and other problems. Tumours from other parts of the body can spread (metastasize) to the vertebrae, the supporting network around the spinal cord or, in rare cases, the spinal cord itself. Spinal tumours progress at different rates. In general, cancerous spinal tumours grow more quickly, and noncancerous spinal tumors tend to develop very slowly. Spinal magnetic resonance imaging (MRI). MRI uses a powerful magnet and radio waves to produce images of your spine. MRI accurately shows the spinal cord and nerves and yields better pictures of bone tumors than computerized tomography (CT) scans do. A contrast agent that helps to highlight certain tissues and structures may be injected into a vein in your hand or forearm during the test. Some people may feel claustrophobic inside the MRI scanner or find the loud thumping sound it makes disturbing. But you’re usually given earplugs to help with the noise, and some scanners are equipped with televisions or headphones. If you’re very anxious, ask about a mild sedative to help calm you. In certain situations, a general anesthetic may be necessary. Computerized tomography (CT). This test uses a narrow beam of radiation to produce detailed images of your spine. Sometimes it may be combined with an injected contrast dye to make abnormal changes in the spinal canal or spinal cord easier to see. Treatment for a spinal tumour may include surgery, radiation therapy, chemotherapy or other medications. It’s not clear why most spinal tumours develop. Experts suspect that defective genes play a role. But it’s usually not known whether such genetic defects are inherited, occur spontaneously or are caused by something in the environment, such as exposure to certain chemicals. In some cases, however, spinal cord tumours are linked to known inherited syndromes, such as neurofibromatosis 2 and von Hippel-Lindau disease. Spinal cord tumours are more common in people who have a prior history of cancer. Any type of cancer can travel to the spine, but the cancers that may be more likely to affect the spine include breast, lung, prostate and multiple myeloma. Spinal tumours are also linked to Neurofibromatosis 2 which is a hereditary disorder where noncancerous tumours develop on or near the nerves related to hearing, which may lead to progressive hearing loss in one or both ears. Some people with neurofibromatosis 2 also develop spinal canal tumours, frequently multiple and of several different types. Individuals with Von Hippel-Lindau disease, a rare, multisystem disorder associated with noncancerous blood vessel tumours in the brain, retina and spinal cord and with other types of tumours in the kidneys or adrenal glands, can also develop spinal cord tumour. 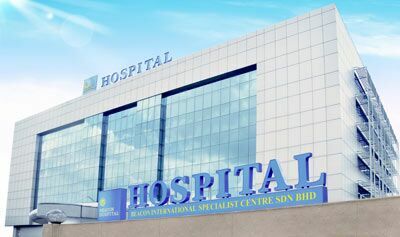 At Beacon Hospital’s Brain & Spine Centre, a team of experienced spine specialists and neurosurgeons are on hand to treat conditions including spinal cord tumours, as well as spine and nerve disorders. Microsurgical, minimally invasive and personalised treatment options tailored to suit individuals are also available. Both noncancerous and cancerous spinal tumours can compress the spinal cord and nerves, leading to a loss of movement or sensation at and below the level of the tumor and sometimes to changes in bowel and bladder function. Nerve damage may be permanent. However, if a spinal tumour is caught early and treated aggressively, it may be possible to prevent further loss of function and, with aggressive rehabilitation, regain nerve function. Depending on its location, a tumour that compresses the spinal cord itself may cause permanent disability.